Also among the iterations of smartphones released in Sao Paulo, Brazil is the least of the bunch – the Moto G6 Play. 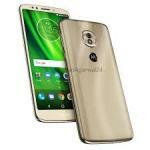 The smartphone happens to have a trimmed down spec sheet compared to the Moto G6 and G6 Plus. However, it is more affordable than the others and has quite a number of decent offering. You would also get some premium features like a fingerprint sensor, a nice 18:9 aspect ratio and very impressive glass build.